To see Europe’s finest castles, travelers often head to the stately manors of the United Kingdom or the chateaux of France. While these destinations convey a sense of grandeur, they can be very pricey to visit. Portugal, on the other hand, keeps a host of secrets inside the Alentejo, an area that encompasses much of its countryside. With acres of gnarled cork forests leading up to rugged stone fortresses dominating hilltops, the region reigns over its own piece of medieval history and invites you to live like a king, even if only for a few days. Until recently, the Alentejo has remained virtually undiscovered by visitors because it hasn’t been very tourist-friendly. Although it retains its old fashioned ways—widows stand in village archways wearing traditional black garb and leather-faced men congregate on street corners curiously sizing up outsiders—things are starting to change. Thanks to advancements in the region, people like you and me can easily reach the region’s castles, all 50 or so of them, by car. The sheer number can be attributed to King D. Dinis I (1279 – 1325), who rebuilt most of these former Roman and Moorish frontier fortresses in the interest of national defense. The land is relatively flat, so wherever there was a hill, a castle was built, and a town soon followed. As you drive across the region, you’ll see many of the hill towns and their castles jutting right out of the landscape. But just how different is the castle experience in Portugal than that of the U.K.? Humphrey says, “Apart from Royal residences, many of the U.K. castles are preserved well but do not continue to have a function other than provide conducted tours for visitors. In Portugal, the castles and fortress constructions are often still part of the existing community and so it allows a more tangible mood of the times to be recreated in the visitors mind.” Because these structures are integrated into daily life rather than tourist attractions, access is completely free to the public in most cases. 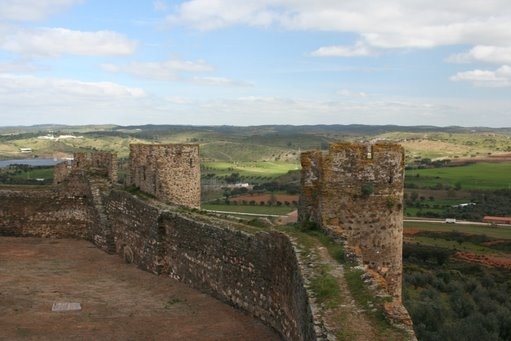 A few castle towns stand out and have key defensive positions along the Spanish border. With one of the tallest castles in Portugal, Marvão is a fortified city in the northern Alentejo that towers over its Iberian neighbor. Igreja de Santa Maria, a whitewashed church with a tidy boxwood garden, marks the entrance to the majestic granite edifice. There’s a small military museum that charges a nominal admission fee, but the castle is free to visitors who are welcome to climb the towers and ramparts at will. Illuminated at night against a blackened countryside, Marvão resembles its own constellation and can be seen for miles. Along the winding road a few miles north of Marvão, Castelo de Vide is best known for its fountains and hot springs, 24 churches, and 13th-century Jewish Quarter. Traditional white houses roofed with red tiles line this spa town made up of narrow streets. With a handful of friendly cafes, the main square is a good place to stop for a snack, especially the local boleima de maçã, similar to a homemade Pop Tart filled with apples and walnuts but with no unnecessary sugar added. To the south, Elvas hustles and bustles as a modern-day cross-border city that proudly showcases a true castle’s castle. Within the fortress walls, visitors can explore walkable battlements, turrets and a keep, and a governor’s residence. There’s also a small gift shop, which offers brochures in English, but unlike other castles, there’s a small entrance fee of €1.50. The classic medieval town of Monsaraz overlooks Spain, as well as the Alentejo’s vast olive groves and vineyards. Church steeples and castle towers peek through cobbled streets and stone arches, framing shots from every angle and rendering it a photographer’s delight. The village rug weavers and artisans draw many tourists. Away from the border and centrally located, the UNESCO World Heritage city of Évora is the beating heart of the Alentejo. A giant Roman aqueduct leads up to this walled city, the largest in the region, and visitors are encouraged to park on the outside and explore this university town’s culture-packed city core on foot. A stone’s throw from Évora, Évoramonte rests on a small hill with one main road running through the town. Its old castle has been restored with concrete, and circled by rope embellishments in the masonry that tie up the whole structure with neat bows. Nearby, the castle at Estremoz has been converted into a hotel, and much of the town’s architecture, as well as the sidewalks, are made of marble, Portugal’s “white gold,” from nearby quarries. If visiting a castle isn’t enough, you can spend the night in one, even on a budget. Pousadas, culturally significant hotels—many of which are renovated castles, monasteries, or convents—offer some of the best opportunities. I spent a night at Pousada de Crato – Flor da Rosa, a restored convent and castle near Marvão. The vaulted rooms are decorated with dramatic floor-to-ceiling drapes, and also have modern conveniences such as a bathroom with two sinks and a tub that’s enormous by European standards. A hefty buffet breakfast is included in the room rate, which starts at €161 per night in the off-season. While the pousada is considered a splurge in the Alentejo, you get a lot for your money. Other Alentejo pousadas include historic properties in Estremoz and Évora. Vila Viçosa has its own located right next to the Ducal Palace, which housed the Dukes of Bragança, Portugal’s second most powerful family next to the royal family. If you’d like to save on accommodations, Pousadas de Portugal offers seasonal promotions and bundled pousada passport packages. Those truly on a budget will do better staying at small inns or guesthouses. Although not a castle per se, Casa de Terena is a centuries-old bishop’s house situated just steps from the castle in the heritage village of Terena. Owner Stella Doveton-Helps is originally from South Africa and has trotted all over the world, landing recently in Portugal. She welcomes you with a cocktail as she introduces you to her home, which she and her husband Jeremy bought and refurbished a few years ago. The six guestrooms have fresh, trendy touches and start at €80 per night for a double, and also include a daily breakfast of local ham, several types of goat and sheep cheeses, orange and banana breads, yogurt, and coffee. Stella has culinary training and will make dinners upon request for €18. For other small hotel options, try Solares de Portugal or Secretplaces.com, or search the listings at Visit Portugal. The Alentejo for Under $500? As usual, one question remains: Can you visit Portugal’s Alentejo for under $500? Yes, so long as you take airfare out of the equation. As airfare to Europe has been steadily rising, the days when I was able to take an entire trip to Portugal for under $500 are long gone. At best, off-season fares to Lisbon from New York, the cheapest U.S. departure point, can be found for about $550. You’ll need a car to reach all the scattered castle towns, so the best way to save is to rent one with a standard transmission, as automatic cars can be more than twice as expensive. Expect to pay around €200 or less for a standard economy car. Also try to conserve gas, which is much more expensive than in the U.S., by plotting your daily routes efficiently. Once you’re on your way, you’ll be driving toward the towers and turrets of the Alentejo, with money matters a distant memory. Next month, I will tell you all about the Alentejo as an up-and-coming wine and gastronomic destination.